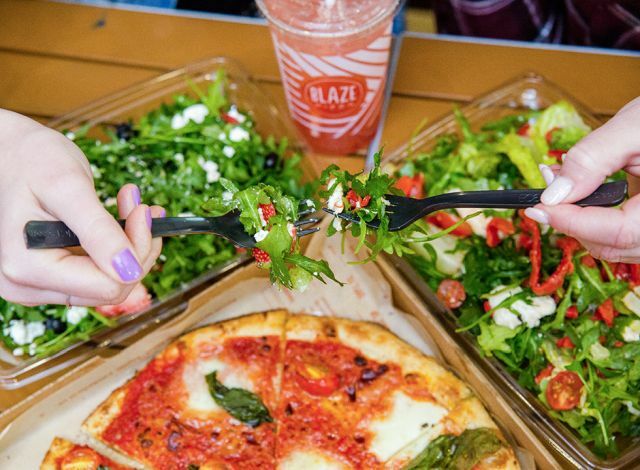 Blaze Pizza adds new Simple Salads to their nationwide menu featuring a number of salads, including the Classic Caesar and BLT Cobb. The salads can also be had on a pizza crust as a Salad Pizza. - Tomato and Mozzarella - Wild baby arugula, Romaine lettuce, cherry tomatoes, ovalini mozzarella, roasted red pepper, and basil pesto vinaigrette. - Arugula and Fresh Fruit - Wild baby arugula, seasonal fruit, goat cheese, and balsamic glaze. - BLT Cobb - Applewood-smoked bacon, Romaine lettuce, cherry tomatoes, Gorgonzola, red onions, wild baby arugula, and buttermilk ranch dressing. - Classic Caesar - Romaine lettuce, parmesan, Asiago croutons, and Caesar dressing. - Kale, Quinoa and Cranberries (vegan option) - Kale, red quinoa, dried cranberries, and a citrus vinaigrette. The new salads are available as full-size entrees and side salad portions. The Salad Pizzas take any Simple Salad and serves it on top of a warm garlic pesto and parmesan crust.